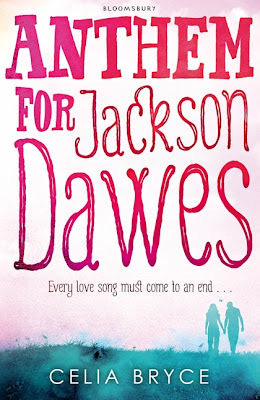 When Megan Bright arrives in hospital for her first cancer treatment, there is only one other teenager there - Jackson Dawes. He is cute, rebellious...and infuriating. Even so, Megan finds herself slowly and surely drawn to him. But so is everybody. Jackson is a whirlwind of life and energy, warmth and sparkle. Megan will need some of his extraordinary optimism as they face the difficult times ahead. An uplifting story of bravery, loss and love against the odds. But it is. When she arrives on the ward, she is instantly drawn to Jackson whether she knows it or not. 'Anthem for Jackson Dawes' is an inspiring and truthful story, with loveable characters facing love, loss and trauma all at the same time. As soon as I saw this book, I knew it would be an emotional one. I can't just pick one favourite character from the story - I have three! Firstly Megan, because she stays strong during her treatment, and the story is from her point of view. Also she is a really believable character. Secondly, Jackson, for brightening up the other patients lives and for being there for everyone. And lastly, Kipper, the seven year old girl with cancer - I felt so sorry for her and really wanted her to recover. Towards the end of this story, it actually made me cry a little bit, and as someone once said, "People will only grieve for a character if they like them." I really like the cover, it reminds me of a sunset turning into night sky. I only just noticed Megan and Jackson holding hands in the bottom right corner, that's really sweet. My only complaint about this book is it seemed too short! I felt like there was more story to be told, but then it just ended quite suddenly. However, this really is a brilliant book! I recommend it to readers aged 12+. 5/5!